“Rozwijanie kreatywności dorosłych” (G.A.M.E- Get Adults Make Events) to projekt realizowany przez Centrum Kształcenia Ustawicznego w Białymstoku w ramach programu GRUNDTVIG – Projekty Partnerskie Grundtviga. Projekt finansowany jest ze środków Komisji Europejskiej w ramach programu „Uczenie się przez całe życie”. registered the points that each player score in every trick. cards from the middle deck on „ must”. When the cards are dealt the players go to auction. They check how many points they are able to to draw from the cards, which are in hand, Aces and reports for the charges to their point value. The person who sits on the left of the dealer starts with one hundred. It is a constant value. It doesn’t matter what a player really has in the cards. Another player can say: ”One hundred and ten or one hundred and forty” if he wants to block other players. However, he must be sure that he will be able to take such a number of points. Each player has the right to end the game and pass. After the auction, a player who sits on ”must” shows these cards and gives them to the winner of the auction. Then he hands one card to each player and the trick starts. First, the winner of the auction puts his cards. He can start with the report. Report is Queen and King in the same suit (Hearts – 100, Diamonds – 80, Clubs – 60 and Spades – 40 points). 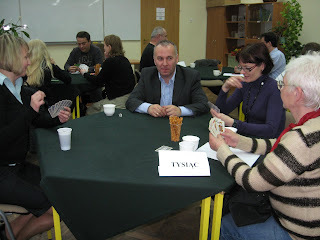 Then, successively the players play to match the suit of their cards. The player whose card is the highest wins the trick. He takes all the cards and he puts the new card on the table. The game goes on as long as any player gets more than 1000 points. - Centro Territoriale Permanente „L. Pirandello” we Włoszech.